Papaya, (also known as papaw or pawpaw), is a juicy fruit that can be consumed whether ripe or unripe. You can include papaya in your salad, juice, sherbet or pie or eat it raw as part of your breakfast. When unripe, you can cook it like squash and add to your favorite pork or fish soup. It is also one of the popular folk medicines. From the roots to its juice, fruit, seeds, and leaves, the papaya is believed to have a lot of medicinal benefits. Eating its ripe fruit is known to relieve constipation. Its juice is used for thickened skin and warts. You can also dry papaya for later consumption. The known methods for drying papaya at home include the use of an oven, dehydrator or placing it under the sun. Rinse your papaya under cool, flowing water. Using a vegetable brush, cleanse the outside part carefully. A ripe papaya can be very soft to hold and its skin can easily tear. If you don’t have a vegetable brush, you can use a new and unused scouring pad as a substitute. Remove the papaya skin gently using a peeler or a knife. Slice the papaya in half and remove the seeds. Slice the papaya into ¼ inch thick slices. After you’ve cleaned and sliced the papaya, lay the slices in one layer on a cookie sheet. You can also use a muslin, cheesecloth or a thin, absorbent cloth as a substitute for the cookie sheet. Set your oven at 100 degrees Fahrenheit. Bake the papaya slices for a maximum of 12 hours. Leave the oven door at least 2 to 4 inches open. This will help the moisture to escape from the papaya. Before doing this, make sure that the oven can’t be reached by small kids or your pets. Check on the slices after 6 hours of baking. After that, monitor them every hour. Once they’re dry, brittle, and cool to touch, they are ready for storing. 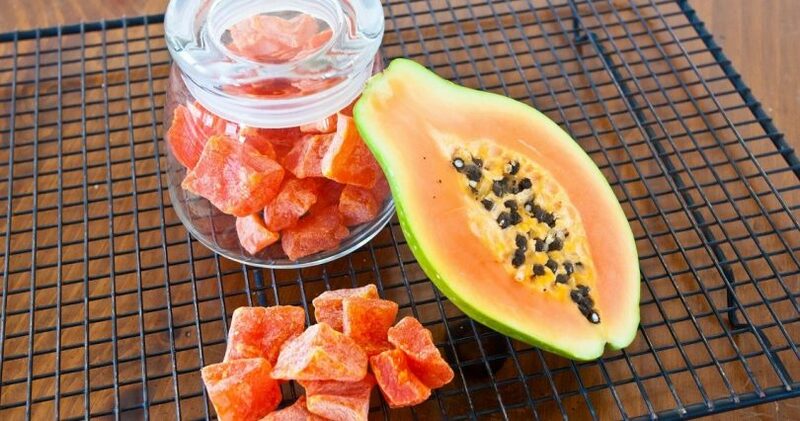 Place the dried papaya inside a sealed container. Store them in a dark, cool area. You can sun-dry papaya if you have an outdoor temperature of 85 degrees Fahrenheit and a humidity of less than 60 percent. Once you’ve rinsed and cut the papaya, spread the papaya slices on racks or clean screens. Cover the slices with muslin, cheesecloth or thin, absorbent cloths. This will prevent insects from laying eggs on your produce. Make sure that the racks are out of reach of small kids or pets. Turn the slices once a day to ensure even drying. Once they’re dry and brittle, place them under room temperature for some cooling time. Put them inside a sealed container and store in a cool, dark place. Once you’re done cleaning and cutting the papaya into thin slices, spray papaya with lemon juice. Lemon juice can help prevent papaya from browning. You can place the lemon juice inside a spray bottle and spray a small amount on the slices. Place the slices on the rack. Make sure that there’s no overlap for even dehydration. This will also prevent the slices from sticking together. It is recommended not to dehydrate a fresh batch with a slightly dry batch. Doing so affects the quality of the produce. Also, place the papaya slices on the bottom rack if you plan to dehydrate them together with other fruits and vegetables. This will ensure that the papaya’s juice is not absorbed by the other produce. Follow the time and temperature indicated on your dehydrator’s user’s manual. Otherwise, set the temperature at 125 degrees Fahrenheit. Depending on the humidity of your room, drying papaya using the dehydrator should be finished after 6 hours. Turn the slices every two hours. The process is complete once the slices look dry, rough and bendable. If you can still see moisture, put them back inside the dehydrator. Check on them every hour. Place the slices inside a clean, airtight container and store properly. Whatever drying method you use, condition the papaya slices to balance the moisture left in them. This will prevent molds from growing. To condition, place the papaya slices inside a dry, sealed container. Let it stand for 7 to 10 days. Shake the container every day so the slices won’t stick together. If you notice any water buildup inside the container, repeat the drying process. You can use any container that has an airtight seal to store your dried papaya. It can be glass or plastic jars, or even plastic freezer pouches. The rule of thumb is that the container should be thick enough so it won’t tear easily. Make sure to clean the container and dry it properly. Store the dried papaya in packs that are small enough for one-time consumption. Dried papaya that is placed in a big container, which is opened from time to time, will allow moisture to be absorbed inside the container. This will cause the food to spoil. Once placed in a sealed container, store the dried papaya in a cool and dark area. The recommended storage temperature is 60 degrees Fahrenheit. Depending on the temperature in the storage area, the dried food can be kept for 4 months up to a year. Monitor the stored dried papaya regularly to check if there is moisture. If there is, the produce should be consumed immediately. You can also dry it again and store for later use. But if you see or smell mold, you should throw it away. Drying papaya is a great food preservation technique. It will allow you access to healthy food right from your home. It’s also cost-effective since the papaya is easy to grow. You can dry as much papaya as you can during the dry season and store it for later consumption.